mushroom | Have YOU Ben Starr Struck? 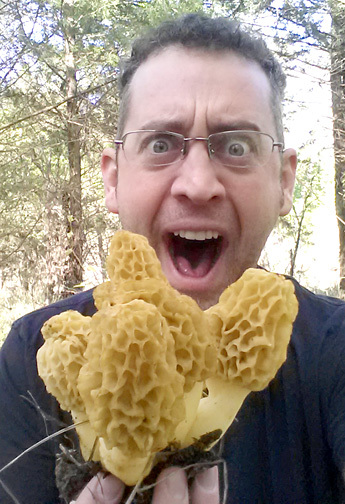 Anyone who classifies themselves as a “foodie” knows about morels. These miraculous mushrooms are the most coveted table fungus on the planet, rivaling the reputations of even the black and white truffles of southern Europe. However, unlike truffles, which CAN be cultivated and dependably harvested, the morel has resisted ALL attempts at cultivation. Every single morel eaten in the world was foraged in the wild. I’ve been cooking with morels for years. They are ruinously expensive in Dallas, but I often travel to Seattle during morel season there, when they can be sometimes be had for $20 a pound from roadside vendors and occasionally at the Pike Place Market in downtown. 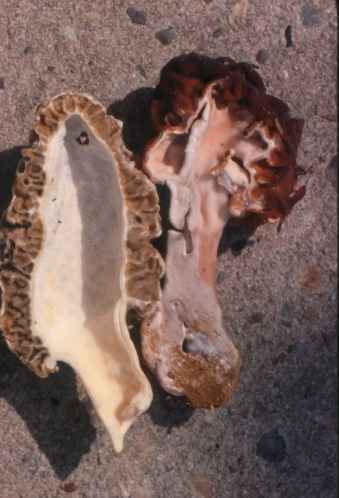 (Morels typically fetch between $50 and $100 a pound in gourmet markets around the world.) Over the past few years, as I’ve grown more serious about foraging, I was shocked to learn that morels even grow right here in Dallas, with their southern-most boundary being the juniper-covered limestone hills near Austin, Texas. 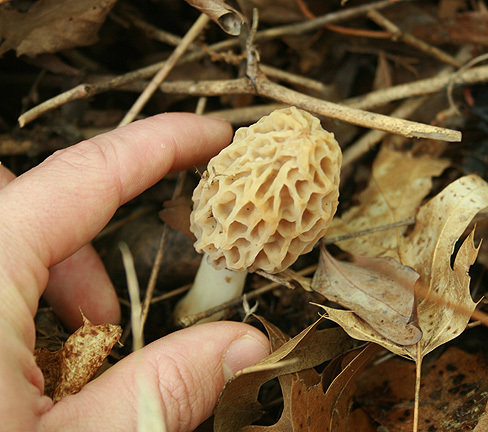 Unfortunately, morels need a perfect balance of temperature and moisture to trigger their fruiting, and Texas often gets too warm early in the spring before the rains come, meaning a pitiful morel harvest. This year I waded through endless tangles of poison ivy here in the Dallas area, frantically searching for morels. But the rains came too late, and it was already too hot for these magic morsels. So I headed north this past weekend to catch the end of morel season in northwest Arkansas. 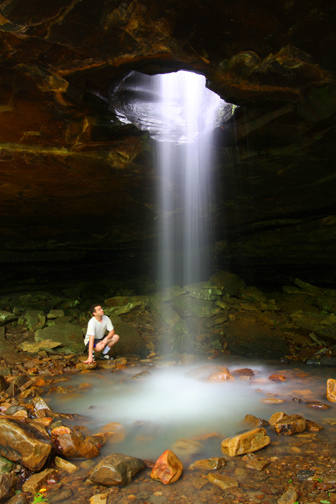 Hidden in a deep canyon in the Ozark Mountains lies the Buffalo National River, a pristine mountain stream that, thanks to a special designation by Congress in 1972, flows completely free from its headwaters to its confluence with the mighty White River. 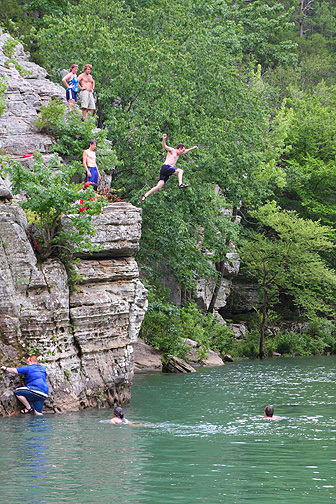 The Buffalo River has been my playground of choice for 15 years. 6 hours from my doorstep, the Buffalo is one of the best places on earth for canoeing, hiking, and caving…3 of my biggest hobbies that don’t revolve around food! So any time I can visit one of my favorite non-food places, and get to include food on the itinerary, I’m stoked. And I had a strong hunch that I’d be able to find at least a handful of morels after a recent cold spell up there, followed by several inches of rain, followed by warm days in the 80s…the perfect storm to trigger morel fruiting. Jasper is about as quaint a town as you’ll find in the US. It was founded in the mid 1800s and was burned to the ground by the North during the Civil War. The charmingly decrepit buildings in downtown were built shortly after, and now house restaurants and galleries that are refreshingly un-pretentious and authentic. Like, for instance, the Ozark Cafe, which has been in operation since 1909. I have breakfast there every time I’m in Jasper. For about $5, you get a belt-busting, no-frills breakfast of eggs, sausage, hash browns, biscuits, and the most delicious white gravy I’ve had anywhere. After filling up, we headed to the banks of the Buffalo to start hunting morels. I had a fragment of information from a friend who had been there the weekend before and found a few morels, but not enough to make me confident. We started down a trail near the river, and when things “felt right” we slogged off the trail and into the woods, thick with thorny greenbriar and infested with ticks! And in less than 5 minutes, at the base of a white oak tree, a golden morel poked its wrinkled head up out of the leaves and smiled at me. And once I had calmed down after what was quite a spectacular freak-out…on the OTHER side of the tree was this massive cluster of morels. I had a fan gasp that I had “pulled them up from the roots” so let’s chat a bit about mycology. Mushrooms are the fruit of a fungus that lives in either dirt, leaves, wood, or dung. The fungus consists of hair-like filaments called “mycelium” (pronounced “my-SELL-ee-uhm”). The mycelium of morels lives in harmony with a host tree, and the type of tree varies from region to region. Near Austin, morels grow almost exclusively with juniper trees. Near Dallas, they like elms and cottonwoods. Along the Buffalo River, it’s white oak trees and nothing else. Mushrooms don’t have roots…they grow out of the mycelium, which are a far vaster network than you’d probably imagine. Picking them with some of the mycelium still attached does no damage to the mycelium, and in fact if there’s a rain within the next 48 hours, the scarring of the mycelium from the pick can produce a second fruiting. So there’s no harm if it looks like the mushroom has “roots” on the bottom. But most mushroom hunters pinch the mushroom off at ground level so that the dirt doesn’t get all over the other mushrooms in the bag! Over the next hour, we gathered 2 pounds of morels, some of which were almost as big as my fist! It was a magical morning, as the sun was at a perfect angle and lit up the hollow mushrooms so that they practically glowed above the brown leaf litter. It felt completely surreal. All the mushrooms were growing right at the base of white oak trees, except for a few growing seemingly nowhere in general along damp, sunken areas within a dozen feet of white oaks. Some had been devoured by woodland creatures, but most were fresh and plump and begging to be plucked! One of the great things about foraging in Buffalo River country is the scenery. It’s not just endless forest. It’s filled with waterfalls! This is Twin Falls along the Buffalo near Camp Orr, a historic Boy Scout camp. They named it Twin Falls long ago, before natural erosion split the stream into 3 separate cascades…I guess we should now call it Triple Falls. I once swam in the pool at the base of this falls with a baby snake that was VERY aggressive and just didn’t want to leave me alone. Luckily, it wasn’t poisonous, so it was funny watching him try his hardest to attack me. They call it that because the roar of the falls hemmed in between the cliffs is deafening. In the video you’ll see at the bottom of this post, it took me HOURS to try to extract any useable audio from this section of footage because it was so loud. After about 8 miles of hiking, mostly off-trail bushwhacking, Michael and I were completely exhausted, especially since we hadn’t slept at all the night before. So we ended the evening back in Jasper at the Arkansas House, an inn and cafe that occupy historic buildings including the old Jasper mill. The cafe used to be my favorite diner in all the world, but the new owners have taken the menu upscale and local. 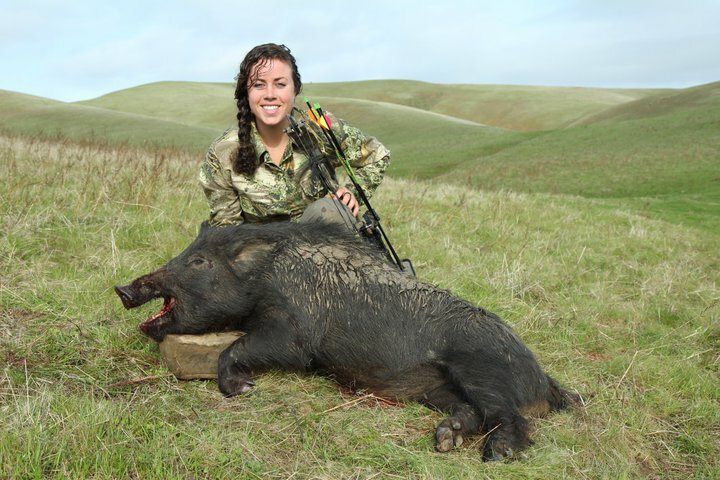 Virtually everything they serve is from local farms, even the meat. I ordered a burger made from wild-trapped razorback hog, which is an invasive species that does lots of damage to the forest floor. (AND they eat morels! Grrrr…) Michael ordered elk meatloaf. Wild elk are extremely common in the valleys of the Buffalo River, but they are also farmed locally. I know first hand from my own restaurant how expensive and cumbersome it is to source local ingredients, so I give Arkansas House full props for trying to maintain an all-local menu. Their prices reflect their avoidance of mass-produced, commercial ingredients. They may want to send their chef for a refresher course at culinary school for a few weeks, because we did find the preparation, seasoning, and presentation to be a bit below the standards you’d expect in a big city at similar prices…(their premium entrees range between $25 and $45, but many things on the menu are cheaper.) However, for a city of 500 in the middle of the mountains in rural Arkansas, it might as well be Noma. I will happily return again and again. After 14 hours of sleep, we were back to foraging in the same “honey hole” we found the day before. 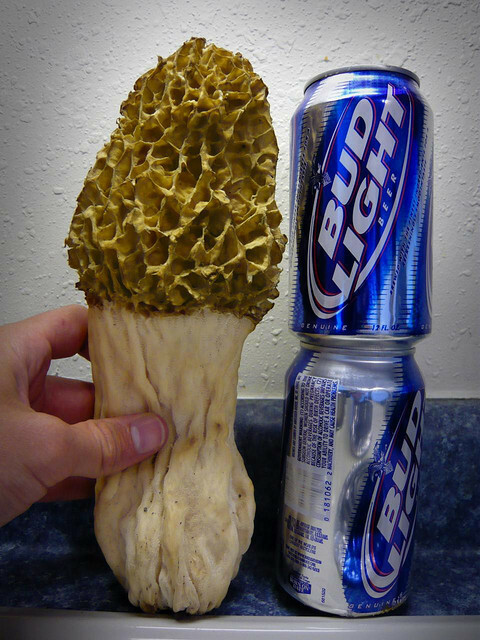 (That mildly disgusting term is popular amongst morel hunters to indicate their secret spots they return to, year after year, for dependable harvests.) We gathered an additional pound, before it was time to show Michael a few of the Buffalo’s more exciting natural features. Lost Valley is the single most popular hiking trail on the National River, and it leads a mile and a half up a hidden canyon to spectacular wonders. 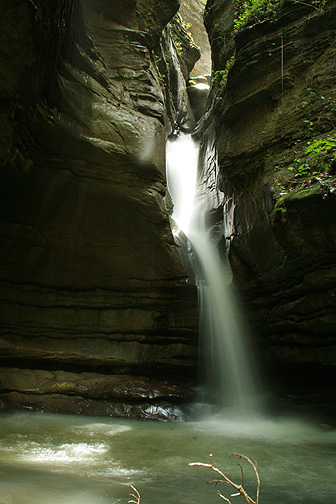 The first is a natural bridge, through which flows the valley’s stream. This is cave country, the rock here is made of limestone, which is easily dissolved by weak acid. 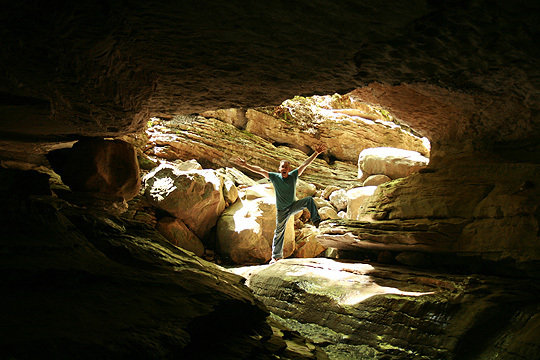 Some of the most spectacular caves in the country are here, including Arkansas’s longest, Fitton Cave, with over 17 miles of mapped passage. 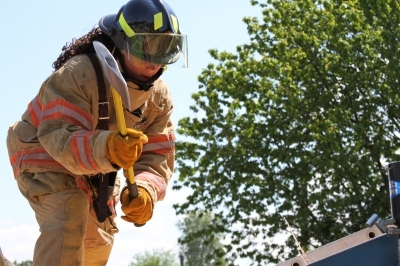 I’ve been in Fitton a dozen times, but not recently, as a mysterious disease called “White Nose Syndrome” is devastating bat populations across the country and is believed to be introduced from cave to cave by cave explorers. So all caves with bat populations are being carefully controlled right now. 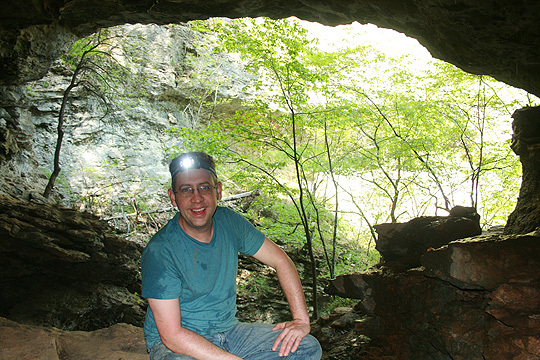 (This has prevented me from exploring many caves during my recent travels, but, like all responsible cavers, I refuse to enter ANY closed cave to protect the bats.) I realize many people are scared of bats, but they are as important to our food supply as honey bees, and if bats become extinct…so do we! The bat population of a single cave can devour enough grasshoppers in a single night to fill a dozen 18-wheelers. Imagine the kind of toxic poisons that would have to be sprayed on our crops to keep them “safe” if we didn’t have bats to control the insect population! 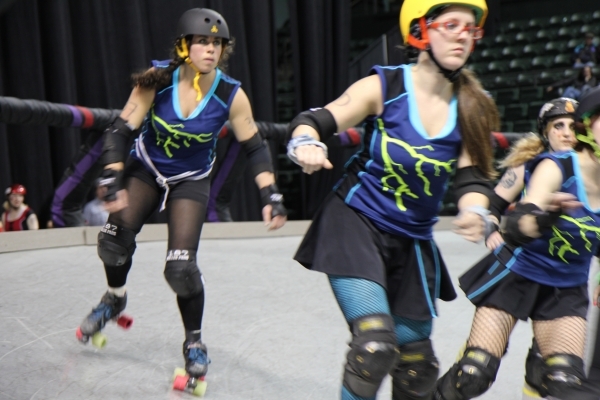 You’ll notice I’m not wearing a helmet. All serious wild caving requires the protection of a helmet. 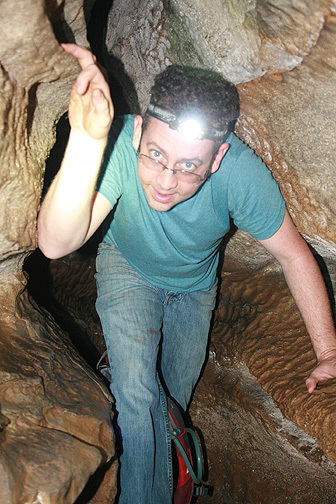 But as Eden Falls cave is scarcely 150 feet long, as long as you’re careful and enter with a buddy, you’ll be fine. This side passage leads back to the final chamber of the cave, and you can tell what’s back there long before you get there, because the roar of thundering water gives it away. A magnificent underground waterfall! 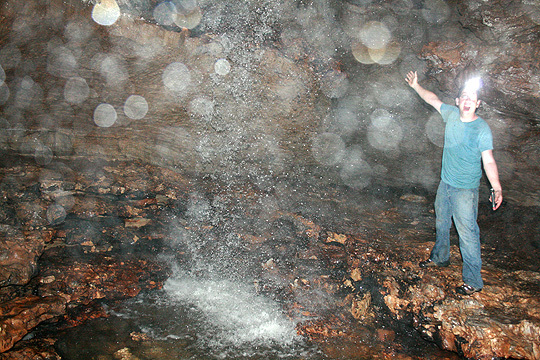 It’s practically impossible to get a good shot of this waterfall, because the air in this chamber is FILLED with spray from the falls, and the flash on your camera lights up every little droplet! While this falls is scarcely more than 30 feet high, it feels like Niagara when enclosed by the cathedral-like walls of the cave. 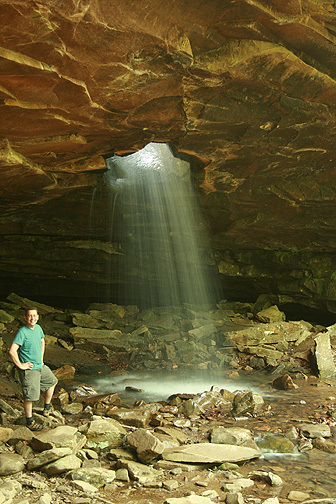 Located deep in a shelter cave in a hidden hollow, this waterfall pours from a hole in the solid rock. Leaving the camera shutter open for a full second allows the falling water to show its motion in a beautiful display. 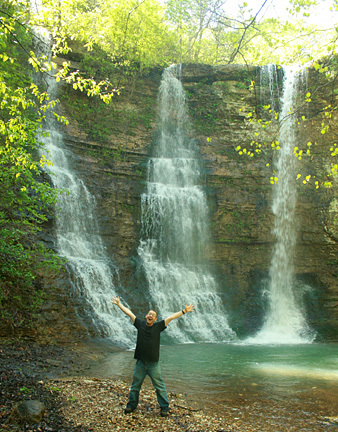 I’ve been to the Glory Hole falls a dozen times. Sometimes, in the peak of summer, it barely drips. In the winter, it is a magical landscape of ice. After a good rain in the spring, it thunders. But it’s always magical. Once I ran across a strapping local mountain man with his handicapped son tossed over his shoulder, carefully descending the creek bed so he could show his teenage son the wondrous spot. 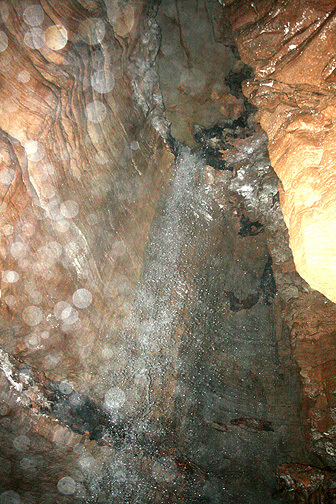 The Old Glory Hole is mostly a secret kept by the locals, passed down through generations, and has struck countless humans, young and old, by its unique beauty. It is a perfect example of why this remote corner of Arkansas is truly one of the most spectacular and surprising landscapes on the planet. These ancient hills have given up their morels and their waterfalls to lucky humans like me for thousands of years, back to the native Americans who inhabited them before European settlers even knew this continent existed. If you’re lucky enough to visit here some day, remember that, and treat this incredible land with the same respect that those who’ve come before you have, so that thousands of years in the future, other lucky people can forage for delicious mushrooms in the river valleys, explore the depths of mysterious caves, and visit the Old Glory Hole to be awestruck by its beauty. Enjoy this 8-minute video of highlights from the trip! Feel free to comment below, and if you’d like to see me document an in-depth 6 month exploration of Western Australia’s culinary secrets, CLICK HERE to find out how you can help by submitting a pic or a 5 second video showing your support!